Yakupov ❿ vs. Ovechkin ❽ – Unjust Comparison? Last week Kelly Friesen wrote a wonderful piece for Yahoo Sports on “Off-base comparisons” surrounding draft-eligible players that was refreshingly accurate. Friesen perfectly broke down the recent comparisons made for top players Nail Yakupov, Mikhail Grigorenko, Ryan Murray, Filip Forsberg and Mathew Dumba deeming them somewhat “off-base” and the whole comparison process “outlandish”. Every year hockey fans are seeking expert’s advice on future NHL players and who they compare favourably to in the big leagues. At the request of hockey’s eager fans the simplest of comparisons in the beginning often become over exaggerated by the time the annual NHL Entry Draft rolls around in June. Nail Yakupov is often compared to Alexander Ovechkin because of his electrifying style of play. In reality, the link is often over generalized and as a result – inaccurate. However, Yakupov and Ovechkin do have similar qualities but they, by and large, are due to their personalities and intangibles. Similar to the “Great Eight”, Nail Yakupov is a Russian winger capable of bringing thousands of fans to their feet in the matter of seconds, as evident by his highlight-reel goal scored Monday night. In Yakupov’s rookie OHL season, I compared the young sniper to Ovechkin and Kovalchuk in the sense that he is an elusive winger capable of scoring almost at will on the rush. However, if the comparison to Ovechkin must be made then let us clearly define the similarities and differences. The resemblances between Alex Ovechkin and Nail Yakupov on the ice are actually less prominent than the ones off the ice. The Russian wingers both emit charismatic personalities despite speaking extremely broken English. Fans adore their easy-going persona and both have become fan favourites within their respective leagues. Hockey fans can easily identify Alex Ovechkin with the gaping hole in his huge smile and Scooby-doo look-a-like appearance. Yakupov will be branded with the same carefree personality but owns a cleaner facade that will surely be popular among the female hockey fan population. On the ice, Ovechkin and Yakupov play with an overwhelming amount of energy and passion that tends to transfer to the atmosphere of the entire arena. In Sarnia, Yakupov has quickly become a fan favourite for his spectacular scoring plays but equally as popular for his creative goal celebrations, much like Ovechkin. On Yakupov’s first career OHL goal he sparked the entire city of Sarnia by jumping into the end glass emulating a young Ovechkin. The passion, the personalities and electrifying offensive rushes are the fairest comparisons between Alex and Nail. The differences among these two star hockey players are certainly distinguishable upon closer inspection. Alex Ovechkin was born in Moscow, Russia to two world-class athletic parents (soccer and basketball stars) and while Nail Yakupov (born in Nizhnekamsk, Tatarsan Russia) does not have that lineage of ’Ovie’, one could argue that he is as athletic as Ovechkin or even more. Ovechkin is a right-handed shot playing the off-left-wing while Yakupov acts as a mirror image shooting left-handed but playing the off-right-wing. The elder Russian, Ovechkin, played four years for HC Dynamo Moscow in the Russian SuperLeague before becoming the first overall pick in the 2004 NHL Entry Draft. The younger Russian, Yakupov, never stepped on the ice in the Russian Superleague (or current KHL). 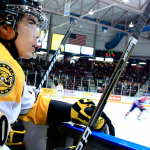 Skating for the junior MHL Reaktor Nizhnekamsk team in one season Yakupov left Russia once he became the second overall pick of the Sarnia Sting in the 2010 CHL Import Draft. Nail and his family immediately decided to chase his dream of playing in the National Hockey League by choosing the major junior route in Canada. These two players have come to North American via different hockey paths but in the end their arrival to the NHL should be through the same rank – the first overall selection. Physically, Yakupov gives up almost four inches and over forty pounds to the Capitals superstar forward placing each of them in drastically different body frames. Despite many reports that Yakupov is as `physical` on the ice as Ovechkin, Nail is a player that will engage himself physically if the opportunity arises but does not engage himself nearly as often. Specifically, Yakupov usually commits to the physicality in spurts during critical times of the game to energize his team. Yakupov does not shy away from contact often going into the dirty areas of the rink but he does not have the imposing size of Alex to physically dominate in the same way. Fortunately, Nail Yakupov has a rare elusive quality to his skating game that allows him to take risks as an undersized winger and his core strength and elite balance makes him difficult to separate from the puck. Goal scoring has been Yakupov’s trademark early in his career, fifty-one last season can confirm that, but he has shown this season he has untapped playmaking abilities as well. Nail Yakupov has improved his points-per-game pace from 1.55 to 1.79 in his second major junior season all without his linemate Alex Galchenyuk who he formed tremendous chemistry with last season. The Sting winger has displayed on a nightly basis his ability to dance around defenders one-on-one and proceed to feed a Datsyuk-like pass to his teammates. The emergence of Yakupov`s playmaking skills this season has added another dangerous weapon to his offensive arsenal. Ovechkin has the ability to make passes through seams but not with the precision and accuracy of the younger Nail Yakupov. Edge in the playmaking department goes to Yakupov. As with many offensive game-breaking forwards, there will always be concerns with his defensive commitment but it is another area that has improved considerably. In Yakupov`s first season in North America he was often caught leaving the defensive zone early in hopes of receiving a breakaway pass. With the help of newly appointed Sting coach Jacques Beaulieu Yakupov is rarely seen leaving the zone early and has paid attention more to his defensive assignments. Beaulieu has Yakupov showing off his speed, quick stick and strong hockey sense on both the forecheck and backcheck and scouts have noticed. Yakupov’s team leading plus-19 rating is a testament to his improved defensive game as he registered a minus-2 rating last season. His defensive development has somewhat mimicked that of fellow Russian sniper Ilya Kovalchuk’s revamped game in New Jersey. How does Nail Yakupov compare to Alex Ovechkin offensively Q There is no sense in saying that Yakupov will be a better offensive player than Alexander Ovechkin who holds countless accolades already in his young career. In seven years of NHL play, Ovechkin has been the recipient of the Calder Trophy, Lester B. Pearson/Ted Lindsay Award (Most Outstanding Player; 3 times), Hart Trophy (Most Valuable Player; 2 times), Art Ross Trophy (Top Scorer with 112 points), Maurice Rocket Richard Trophy (Most Goals; 2 times with 65 and 56 goals) and named to the NHL All-Rookie Team and All-Star Game four times. Yakupov has his work cut out to reach the level of success Ovechkin has had. However, Nail Yakupov does have the offensive skills and work ethic to become a NHL star and it will be interesting to see how he develops. Nail Yakupov’s offensive toolbox is equipped with unique tools that every potential scoring threat needs to build a good career. As mentioned in the opening paragraphs of this article, comparisons can often be confusing and lead to misconceptions although in analyzing skills it becomes a decent benchmark for establishing how a player of Yakupov compares to his future opponents. Case in point, previously we compared the passion, charisma and personalities of Ovechkin and Yakupov. NHL franchises respect these qualities that Alexander Ovechkin offers and they will certainly benefit Yakupov as he shares these admirable merits. Nail Yakupov’s offence is front and centre for all hockey fans to see. His offensive skills are the reason he is ranked number one by every single major scouting service as of today. If we take a closer in-depth examination at the tool box Yakupov carries we will find some note-worthy comparisons in his skill set (although you will notice suffixes –lite and –esque used meaning that he isn’t the exact same player). Yakupov resembles the former Russian sniper Bure in several ways – elite puck skills, tremendous vision, deadly shot and the ability to thrive at top end speed – but it is his powerful skating that emulates Pavel Bure so accurately. Yakupov has a unique hunched-over wide-based skating style rarely found in professional hockey making him look almost awkward at times but it does resemble Bure more than any other player. Like Pavel, Nail is capable of accelerating to top speed within a matter of seconds blasting by opponents and separating himself entirely from the opposition. The power derived from his legs combined with great edge work and superb lateral agility makes Yakupov difficult to contain as he literally ploughs past or through opponents, much like Bure with healthy knees. Recently, Yakupov has started to imitate Kovalchuk more and more in several different ways. Clearly, Kovalchuk has the size that Yakupov will never have but the two are both fantastic skaters and flourish when in possession of the puck. Kovalchuk has made a living on being a productive powerplay contributor often remaining on the ice for the entirety of the man-advantage situation. Yakupov has a similar knack for operating a successful powerplay as he gains the offensive line and slows down the play. The main goal for both players is to set up for the one-timer but Yakupov and Kovalchuk are equally adept at feeding an unexpected pass to a wide open teammate. The current Sarnia Sting star does share one skill-set as the former Sting star Steven Stamkos – a deadly one timer. While Stamkos likely has a harder one-timer, Yakupov has scored a ton of goals from the one-timer position off to the right of the net (opposite of Stamkos). In saying that, Yakupov has a better ability of reading and reacting on the powerplay than Stamkos. Yakupov will abandon the one-timer and send a quick pass to a teammate or abruptly dangle a player en route to the net if he feels it is a better scoring chance giving him more versatility with the man-advantage. There are few players in the history of the NHL as gifted offensively and defensively as Russian Pavel Datsyuk but Nail Yakupov has a few similarities as the shifty reliable Red Wing forward. Now, Yakupov is by no means on the same level as Datsyuk but Nail does possess the unique elusiveness quality that makes Datsyuk so difficult to contain. Like number thirteen, Yakupov is a smaller forward and his elusiveness certainly helps him become as successful as he has been. The elusive quality is a rare one and it usually associated with players with exception skating skills, strong puck control and an unique ability to read his opponents faster than anyone on the ice. Lastly, Yakupov will likely never become a defensive performer on the levels of Pavel Datsyuk (no one will); however, Yakupov does wield a crafty stick in a similar fashion as the ageless Datsyuk making him dangerous in all areas of the ice if the puck is nearby. Nail Yakupov is certainly a unique player and using NHL player comparisons will never accurately justify his rare skillset. In the end, if Yakupov’s toolbox is already established with a good work ethic and you toss in a mix of Ovechkin’s passion and offensive rushing abilities, Bure’s exclusive skating mechanics, Kovalchuk’s dangerous powerplay arsenal, Stamkos’ intimidating one-timer and Datsyuk’s elusiveness then out comes a large sledge hammer eager to nail home a future NHL star – unique in his own right.